The Coby CX-CB12 provides a lot of coverage for the money. It covers longwave from 145 to 285 kHz, AM from 530-1700 kHz, FM and nine shortwave bands: 4.65-5.2, 5.6-6.25, 7.1-7.6, 9.1-10.2, 11.27-12.3, 13.26-14.1, 15.05-15.7, 17.2-18.15 and 21.2-22.8 MHz plus FM. 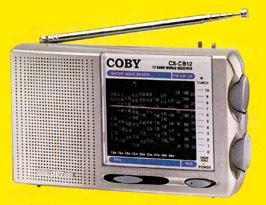 The Coby CX-CB12 includes a flip stand and tuning LED. Requires two AA cells (not supplied) or 3 VDC. Only 6.125x3.675x1.5 inches 10.5 oz.